This week I had the chance to check out ThinkCERCA’s special Teach the Elections tips and resources for teachers. The team at ThinkCERCA believes as strongly as I do that students need to be well-informed, critical thinkers. ThinkCERCA is an online literacy platform for teaching critical thinking through argumentative writing. They’ve developed a set of resources to help teachers show students how they can get involved in the election. Students of all ages should understand their roles as well-informed citizens even if they aren’t able to vote just yet. ThinkCERCA has launched the Teach the Elections website, an online elections center which features free classroom resources and tips. 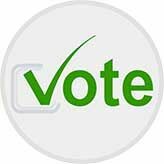 What will you find on ThinkCERCA’s Teach the Elections website? I definitely encourage teachers to explore ThinkCERCA’s Teach the Elections website as they prepare to incorporate the upcoming national and local elections into their classroom. There is a weekly #CERCAtheVote Prompt that teachers can use to help students think critically. These debatable prompts ask students to take a look at claims made by politicians on the campaign trail. Students will then evaluate the evidence and reasoning used to support candidates’ statements, as well as counterarguments that should be addressed. In addition to the #CERCAtheVote prompts, teachers can access downloadable graphic organizers to share with students. The content team at ThinkCERCA designed graphic organizers that are specifically connected to the election. These graphic organizers help students share their arguments about any local, state, or national election issue. When teachers download this packet they’ll find graphic organizers for writing a persuasive letter to a local newspaper or representative. ThinkCERCA’s Teach the Elections website has over 100 lessons for teaching 2016 election issues. This includes plenty of free content like reading and academic writing lessons to help teachers educate and discuss election issues with their students. When you visit their website you’ll find lessons that address issues like criminal justice, climate change, and national security. Whether you’re looking to incorporate a particular issue into a class discussion or looking for critical thinking resources, you’ll definitely want to check out ThinkCERCA’s Teach the Elections website!